Ichi Ichi is a single horizontal line, the first character in Chinese. It is unity, the source of all things, the number one. It shows relationships within characters. Ch'uan Ch'uan looks like three waves — it is a river formed by smaller streams. Ching2 Ichi and Ch'uan combine to make the sound/image Ching2. The river (Ch'uan) flows underground (ichi). It means underground waterways, including veins and blood vessels. T'ing The t'ing in ching is contracted and looks like the character kung which looks like a sideways "H." It is the square. In Chinese thinking, the square gives shape to all things. T'ing is three horizontal lines connected by a central vertical line. T'ing is a person standing on the ground. Ching3 T'ing (a person standing on the ground) observes and combines with ching2 (water flowing underground) to make the compound character ching3 at left. Mi On the left is mi — it is a strong thread spun from thinner threads. By extension, it means volumes of teachings. 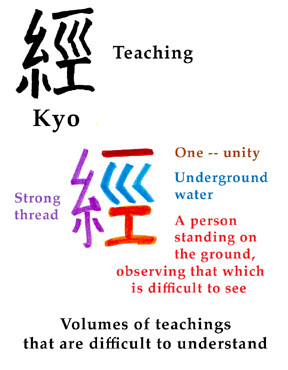 T'ing (a person standing on the ground) observes the source of things (ichi) and where they flow (ch'uan). The deeper the source (ichi) the longer the river (ch'uan). The source (ichi) of Myoho-renge-kyo is infinite and always present. T'ing observes the surface (ichi) and the movement (ch'uan) under the surface. Flowing water (ch'uan) changes but is singular (ichi). It is the lifeblood (ching2) of all Buddhas. Ching (fifth Buddha of the Lotus Sutra) is the Buddha of everpresent eternity. All phenomena are teachings (Ching). "Once you realize that your own life is the Mystic Law, you will realize that so are the lives of all others. That realization is the mystic kyo..."
of the explanation of Kyo (at left). Chinese Characters: Their origin, etymology, history, classification, and signification, by L. Weiger (1965) Paragon Books. The smaller Chinese characters (at top) are all from http://zhongwen.com/, the premiere Internet source for Chinese characters. The colored characters in the Diagram (above) were drawn by Angela Pun and Elizabeth Wang, without whose help this project would have faltered.